We're going to split the numbers recaps into Team Stats and Individual Stats over the next few days. There is just too much good information to share regarding the team today. As recapped here on Cracked Sidewalks, Marquette managed another blowout win in a game that 68%* of Marquette fans regarded as "Super Must Win". How did things end up for this game, and does it mean that the team is finally starting to play better? First things first. It may look like there are really FIVE factors, so we wanted to set the record straight. The Four Factors are effective Field Goal Percentage (eFG%), Turnover Rate (TO Rate), Offensive Rebounding Percentage (OR%), and Free Throw Rate (FT Rate). Efficiency, which may seem like a fifth factor, is a measurement of the game's results. Whichever team wins the Efficiency battle wins the game 100% of the time. Unlike the last game, where Marquette had a then-season worst in Efficiency, the good guys did an outstanding job on offense. 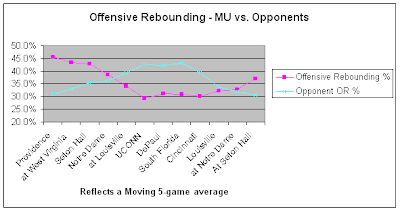 Marquette fared better in three of the four factors on the way to the victory, including a decisive advantage on Offensive Rebounding and Turnover Rate. Remember that Seton Hall was the #5 team in the country at protecting the ball, and we forced them into a below average (average is 20%) showing. Has the team started to turn the corner? If one looks at the key trends for the team, one can see the beginnings of good things with the team. To start with, our Offensive and Defensive Ratings (same as efficiency above), is now trending in the right directions on both fronts. After a long stretch where our Defensive Rating was lower than our Offensive Rating, we are now in the net positive direction. 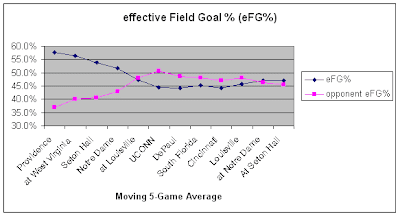 Our effective Field Goal Percentage (eFG%) has also started to improve. This trend is a little bit more tenuous, but at least we are heading in the right direction. Furthermore, if you notice, the reason we are doing better on eFG% is primarily because the defense is getting better. Finally, things are starting to improve with Offensive Rebounding Percentage (OR%). One of the primary reasons we defeated UW@Madison was because the team achieved 50% Offensive Rebounding Percentage. This was an early season strength for Marquette, but it started to suffer greatly during conference play. Now, the team is finally in a situation where our OR% is improving and the OR% of our opponents is decreasing. Is this just more Inconsistency from High Risk Strategies? In a previous entry, we looked at the inconsistency associated with Marquette. Was last night's game just another indication of this same inconsistency? Looking at a moving average of our Pt. Spread Standard Deviation, one can see that we have improved as a team and we are now around the NCAA average. Therefore, not only is the team playing better and returning to some early season strengths, but the team is playing more consistently too. Signs of hope, everybody. Given all of this good news, how do things look for the rest of the season? Pomeroy predicts a final record of 23-7 (12-6) conference. That means losing only once in our last seven games. Based on our conference stats of 105.2 ORtg and 101.5 DRtg, we predict to a conference record of 10.8 - 7.2. That means losing 2-3 times in our last seven games. Based on how we've been playing the last five games (ORtg 108.4 ; DRtg 98.7), we predict to a conference record of 13.4 - 4.6. That's impossible, considering we already have lost five games, but it is an indication that the team has been playing better the last five games. It's time to start gearing up for what should be a wild Friday night against Pittsburgh. The team seems to actually be playing much better and finally returning to what was working in the non-conference part of the schedule. *Poll may not be representative of entire Marquette fan base, but the game /was/ a Super Must Win. Despite Seton Hall's awful performance, the difference was offensive rebounding last night. Barro and Hayward's energy on the offensive boards took the life out of Seton Hall early and they never recovered. Last night also demonstrated how Marquette plays well or poorly as a team more so than others. They tend to shoot well or poorly collectively and have high or low energy collectively. That is one reason that they really need to start games well. This team steamrolls or is stuck in the mud. Thanks for clearing up the four-vs.-five factors. Again I fault Crean for not giving Christopherson and Hazel more playing time in the SH game. Too much for the coaches to think of in a big win? Geeze, if it was sunny and 73 degrees, do you cry if it wasn't 72? I'd call it judgement and fairness. Qualities that you should have in the eyes of recruits and at least some alums if you're paid as Crean is. Would it be a factor to you if you were one of these recruits or walk ons or their parents? His idiosyncrasies in areas where he should be a leader are increasingly evident. Why Crean has had trouble delivering on recruits is not all that surprising to some. Give us a break. They are getting a $100,000 education for free. They are freshman. And finally, they probably really enjoy being on the team which is why we haven't seen transfers in the last couple of years. To criticize the coach over a freshman not getting one more minute in a game is let's see if I can find another term, being a primadona because you don't like the coach.